Usually positioned at the back of the orchestra, members of the percussion section move center stage to reveal the colorful, melodic potential of their instruments in this striking concert of contemporary music. This concert will feature a world premiere performance of Dark Fire for Percussion Quartet composed by Jonathan Kolm and commissioned for the UMD Percussion Ensemble. 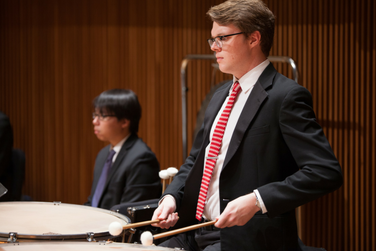 Directed by Dr. Lee Hinkle, the UMD Percussion Ensemble performs chamber music composed primarily for percussion and mallet instruments. Repertoire of historical importance is performed along with contemporary works, transcriptions of classical works and repertoire involving solo instruments with the ensemble.